The Mk. XIV entered service in late 1942. It was a stabilized vector bombsight mounted over alarge, flat panel of glass. It was fitted with a gyro which cold accommodate a 60-degree bank and 40-degree dive without spinning. Evasive acton on the bombing run did not affect the sight's accuracy provided that at least ten seconds of the run were maed in steady flight. If there was no sideslip, the aircraft could be banked at the moment of bomb release without a significant loss of accuracy. The Mk XIV consisted of two main units, the sighting head and the computer. 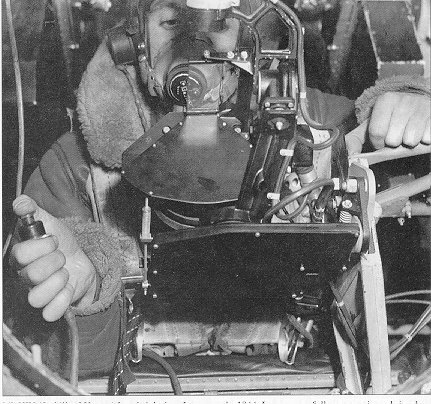 Mounted on the port sode of the nose and level with the bomb aimer's elbow, was the computer, an analogue system whick correlated the various factors associated with aiming, automatically converying adjustments to the bombsights. The sighting head contained the gyro, collimeter, reflector and drift scale. The collimeter was a tube which projected a graticule on the reflector. Looking through the reflector, the bomb-aimer saw the graticule moving over the ground below hime. If the aircraft was flying a correct course, the target appeared with slowness down the graticule's longer axis while the bomb-aimer provided the pilot with the necessary corrections over the intercom. When the graticule's shorter axis bisected the target, the bombs were released.